There are outdoor bars...and then there's Bar SixtyFive. Hidden away on the 65th floor of 30 Rock, it boasts a wraparound terrace providing stunning views in three directions. Well-dressed tourists—from Los Angeles to São Paulo—and locals celebrating special occasions or just seeking refuge from the hot and sticky city below occupy the coveted alfresco tables. 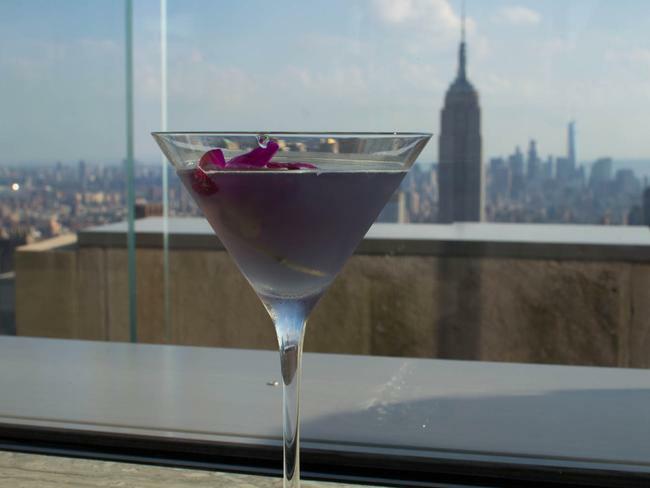 The charm of cocktails enjoyed at NYC’s tallest rooftop bar is lost on no one—even jaded New Yorkers find it hard to resist a selfie with the Empire State Building as a backdrop. And while the skyline may be the main attraction, there’s no better accompaniment than a summery drink (or two) crafted especially for the season. Half of the cocktail list is devoted to classics. Some, like the Papa Doble, the daiquiri style with rum, fresh grapefruit, lime and maraschino that Hemingway made famous in Havana, don’t tinker beyond the addition of premium liquor, in this case Banks 5 Island, an aromatic aged blend that tastes like dark rum even though it’s white. Others such as the Mint T-ulep reinvent. This modern play on the Southern crushed-ice cooler, served in a traditional metal cup, swaps out heavier bourbon for vegetal tequila and adds lavender bitters for a lightly perfumed undertone. The Black Orchid, on the contemporary side of the menu, is a natural beauty. Holding crème de violette, vodka, lemon juice and peach bitters, the sweet-and-sour, cool purple drink (seen in nearly half the patrons' hands) is topped with a magenta orchid that echoes the tropical palm leaf and orchid bouquets framing the bar. Botanicals also add to the appeal of the gin-based Mama Rose, pale blush with fruity, floral notes thanks to rose liqueur and grenadine. Meanwhile, herbs and fruit add an exuberant touch to a number of cocktails coming later this summer. Look out for the Basil Watermelon Cooler, a highball combining rum and ginger with the namesake fresh ingredients, and the Veronique, which pairs rosemary and black grapes in a gin drink that’s sweetened with dessert wine. A lighter sip, the Spatini, puts cooling mint and cucumber to work with elderflower liqueur and gin, finished with a hint of licoricey absinthe. Though cocktails suit the loungey atmosphere, wine drinkers aren’t an afterthought. As the mercury climbs, it’s practically mandatory to drink rosé. The list not only includes a selection from Provence, the go-to region for summer pinks, but two domestic varieties as well as a more unusual Spanish txakoli, an effervescent wine from the Basque region that’s typically white. Don’t want to break from tradition? A flute of bubbly Billecart-Salmon Brut Rosé is never a bad way to toast celebrations big or small.